Guttate psoriasis is a rare form of psoriasis that often appears in the wake of a strep throat infection and tends to affect children and people under the age of 30. Named after the Latin word for drop (gutta) the skin condition begins very suddenly as a rash made up of small, light pink, tear-drop shaped bumps, usually on the torso, arms, and legs. 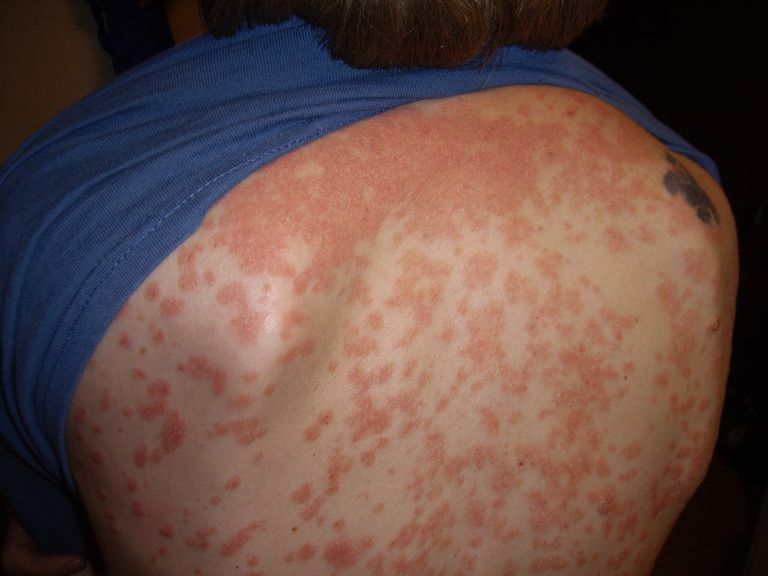 A person may develop guttate psoriasis only once, or it can recur with bouts of strep or other infections. Sometimes, it may be a sign that the patient will eventually develop another form of psoriasis known as plaque psoriasis. Plaque psoriasis, the most common form of psoriasis, is marked by red, scaly, inflamed patches of skin. Though considered chronic, plaque psoriasis is a manageable condition that is not life-threatening or contagious and usually does not interfere with a patient's ability to function normally. Like other forms of psoriasis, guttate psoriasis can run in families. This form of psoriasis accounts for approximately 2% of all psoriasis cases. Approximately 80% of individuals with guttate psoriasis reported having strep throat two to three weeks prior to their diagnoses. Guttate psoriasis also strikes individuals who recently recovered from a cold, chicken pox, or skin injuries or infections, and may also affect individuals who are experiencing excess stress. Some medications, such as drugs for malaria or high blood pressure, can also trigger outbreaks. All forms of psoriasis are believed to occur when our immune systems' infection-fighting white blood cells, called T-cells, malfunction. Under normal circumstances, T-cells fight against foreign invaders, such as streptococcus bacteria, which is responsible for causing strep throat. However, in people with psoriasis, the T-cells actually mistake the skin for a foreign invader and attack it. The rash of psoriasis results from a combination of damage to the skin by T-cells, inflammation in the skin, and overproduction of new skin cells. Guttate psoriasis is easily diagnosed due to the characteristic, tear-drop shaped rash. No additional tests are usually necessary, although individuals who develop guttate psoriasis should have their throat swabbed to see if they are carrying strep bacteria — even if they don't have a sore throat. An episode of guttate psoriasis may last several weeks or months and can occur in individuals previously diagnosed with plaque psoriasis. If someone is having repeated bouts of guttate, they should ​be tested to see if they are a carrier of strep. Individuals diagnosed with both guttate psoriasis and strep throat will need to take antibiotics to treat the strep throat. This is especially important because strep throat is contagious and, if left untreated, can lead to rheumatic fever, a rare but life-threatening illness that can damage the heart and may even lead to kidney disease. The rash of guttate psoriasis is treated with skin moisturizers designed to protect and soothe the skin. Topical steroid creams can help relieve uncomfortable itching. Under most circumstances, guttate psoriasis goes away within a couple of weeks without further treatment. Severe cases of guttate psoriasis may require additional treatment, such as systemic drugs, exposure of the skin to ultraviolet B light, or combination therapy, referred to as psoralen ultraviolet light A or PUVA. PUVA therapy involves using an oral or topical drug, such as methoxsalen, in conjunction with exposing the skin to special ultraviolet A lights in a doctor's office. Ferri, F.F. "Psoriasis." Ferri's Clinical Advisor 2008. First ed. Ed. Fred Ferri. Philadelphia: Mosby Elsevier, 2008. 374-5. "Guttate Psoriasis." National Psoriasis Foundation. Habif, T.P. "Psoriasis and Other Papulosquamous Diseases." Clinical Dermatology. Fourth ed. St. Louis: Mosby, 2004. 209-239. Menter, A. "Guidelines of Care for the Management of Psoriasis and Psoriatic Arthritis Section 1. Overview of Psoriasis and Guidelines of Care for the Treatment of Psoriasis with Biologics." Journal of the American Academy of Dermatology. 58. 5. May 2008. 826-850. "Questions and Answers About Psoriasis." National Institute for Arthritis and Musculoskeletal and Skin Diseases at the National Institutes for Health. May 2003.